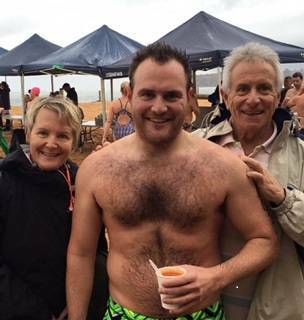 Started off Sunday morning with son Eli and wife Judy at Mona Vale Surf Club where he swam in the 1.2km Winter Solstice Ocean Swim. Eli is an open water swimmer with a twist: he swims all his events butterfly. Last month he swam butterfly for 10km from Bondi Beach to Watson’s Bay, and in November last year he became the first person to butterfly swim the 9km length of Lake Burley Griffin in Canberra. He now has his eyes on attempting the 20km Rottnest Channel crossing in February next year – all of it butterfly! Eli has been butterfly swimming for nearly 2 years now raising money for the veterans’ charity Mates4Mates.